Monday! If anyone went to the Analog Live performance in Los Angeles this past friday, we would love to know what you thought of it. There are a few pictures that can be found: here. Richard Devine has agreed to answer a few questions about Analog Live and it will be posted once everything is in order. Also I have to get in touch with Peter Grenader, who threw the event because somehow I managed to destroy my Plan B Model 15 revision 2 upon arrival along with my Doepfer A-190 MCVS. I am simply that talented. In case you don’t see too much action here this week on trash_audio it is because I’ll be in D.C. pretending to be human around my family. My hours of practicing smiling and walking in the sunlight will be put to the test. Also, don’t forget to write us e-mails about what you think of the blog. So here is Atom™! Since around 1982. I started playing drums in our basement first (just drumming by myself). In 1985 or so I sold the drumkit and got a cheap drum machine. From there on I purchased more machines, mostly analog gear which was cheap because it was out of fashion in the mid ’80s. I released my first record in 1991. It’s still my MPC3000, even though I am not using it much these days. Every now and then I take it out of the closet and play around with it. Every time i am surprised about how good of an instrument it actually is. It’s reliable, playful, simple and sounds good. Oh…and it’s tight too. I am only using one piece of software, which is Protools (currently still on LE 6.4). It’s my favourite because of the same reasons I like the MPC3000: reliable, (fun? ), simple and sounds good. 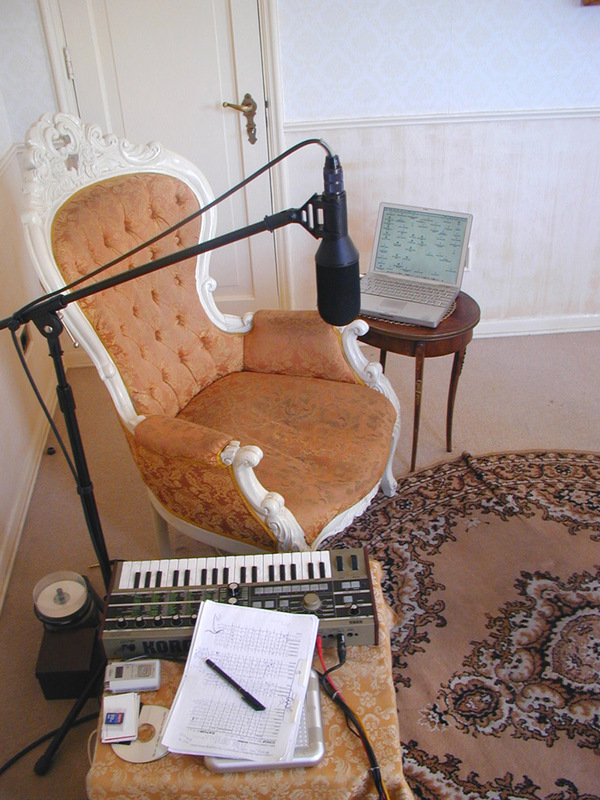 I have restricted myself since the beginning of my musical activities to very simple work environments. I have kicked out equipment rather than bought new one. Some years ago I got stuck with Protools and since then have not used any other software except for some very specific plugins. Some years ago I decided to pay more attention to specific aspects of my workspace such as furniture, curtains, and so on. “Decoration instead of gear” became the motto. All my workspaces had to have big windows and if possible a nice view (even though I tend to close the curtains in summer during daytime). I don’t like “studio” atmosphere. I don’t like cables, gear and the entire tech-look. Environments that make me feel well and relaxed are usually of a different type. I like old furniture, warm colours, ornaments and in general everything that does not look contemporary. The contemporary look usually is contaminated with bad taste and pretentious design. Further, the decoration itself helps to absorb reflections and creates a dryer sound. I can say that the decoration itself, that is, obtaining/installing as well as creating amongst it, gives me more satisfaction than obtaining/installing equipment. I can see why “studios” have to look “tech”, that is because the studio owner needs to impress the entirely clueless cast of customers. There is no reason whatever to follow that look, just because it is somewhat implied in the equipment itself. In general I’m very sensible when it comes to “making music”. I find it hard to focus in other studios that don’t fit my aesthetics and sound. I think that my workspace is a perfect combination of the technical-, creative- and aethetic aspects of my work and it has become what it is through a long development of those three components. Besides my releases on “rather interesting” and other labels and as Señor Coconut, I am doing quite a bit of remixes and production jobs. Just recently I have co-composed and produced a song together with Masaki Sakamoto for the new “Space Invader” game on Sony’s portable Playstation for example. Do you remember your first piece of equipment? A Korg DDM 110 drum machine (a very bad drum machine by the way!). None. yet, I am thinking about buying another painting for the “studio”. 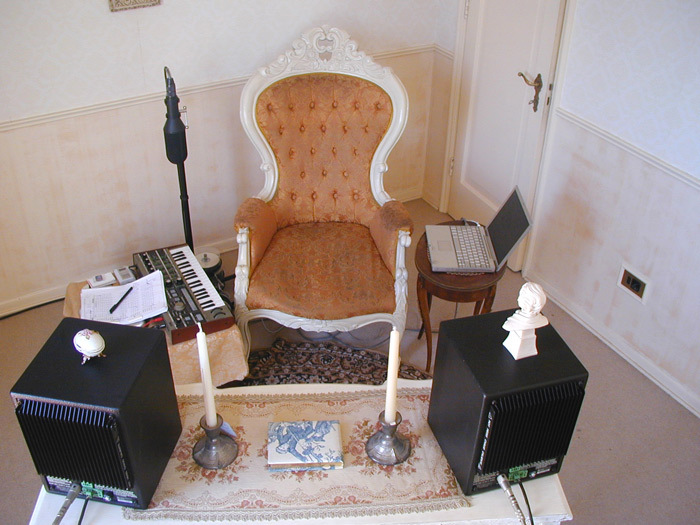 First of all, I don’t call it “studio” but “musikzimmer” (music room). 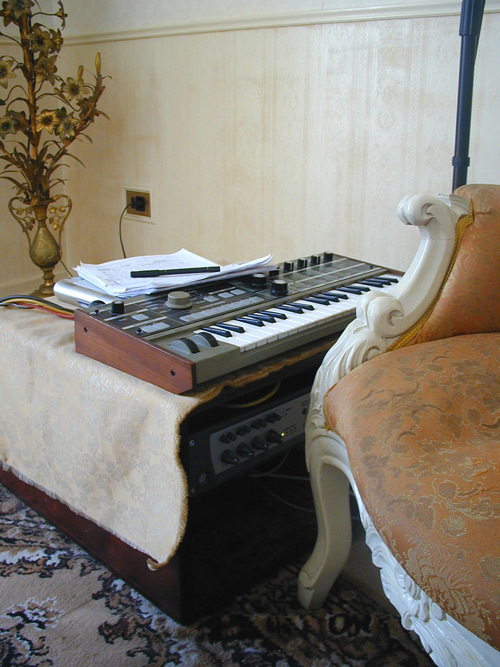 It only contains a G4 Powerbook (12inch), a Digi 002 interface, Meyer sound nearfield speakers, a Microkorg and a Soundfield stereo microphone. The setup itself is portable, yet, to make it easier I just take an M-Box Pro with me and a pair of headphones if I need to work/record abroad. There are different setups for different projects/performances. For Señor Coconut, I just use a recently purchased Macbook, running Ableton Live, (though it’s a piece of software I don’t really like). I use it mainly as a file player, since with Señor Coconut I am playing together with an 8 man orchestra. A “solo” performance setup (as “Atom™”) is under construction. It may contain the MPC 3000 again and maybe the Tenori-on. How many locations have you had your studio setup and how have they changed? I had a studio back in Frankfurt which in the beginning (1985-1994) was mainly old analogue gear and very much in process of “growing” (purchasing more equipment). Around 1994/95, I decided to get rid of all the analog equipment and minimalized down to a setup of just an MPC3000, an Akai S32000 and an Akai DR8 harddisk recorder. In 1997, I moved to Chile and brought the gear with me. I replaced above mentioned equipment by the mini-setup I’m using now during the last 10 years. Here in Chile, I had three physical locations (including the current one) all of them pretty similar: windows, daylight and a nice view. In general my “studio” philosophy has changed in the sense that my interest in gear itself has totally vanished during the last 20 years. Actually I find it more important to focus on the process of creation/composition itself using a reduced selection of machines. From 2001 onwards my motto became: “invest in decoration, not in equipment!”, that’s basically what I did. New hard- or software is just a topic when the current setup breaks down. I prefer to buy a magazine about interior design and decoration rather than the keyboard magazine. Atom™ has dozens of pseudonyms. He indicates that Atom Heart may be better known and one of his favorites being “señor coconut”. He was born in Frankfurt, Germany and moved to Chile in 1997.